They say a rose by any other name would smell as sweet, but as mistaken identities abound, three heroines will put this age-old adage to the test! Love Unexpected: A Storybook Romance is a heartwarming collection of short stories that begs the question: can true love really conquer all? New York City book editor Ellie Hanover has discovered a groundbreaking manuscript that may be just what she needs to save her job. But when her anonymous correspondence with the author begins to develop into more than a professional relationship, Ellie is left wondering if her real find is actually Mr. Right. When Kenedee spies her boss leaving flowers on her desk, she’s swept into a whirlwind of infatuation. If only he didn’t have a girlfriend . . . Undeterred, the young woman enlists in the scheme her employer’s brother has put in motion for the company’s sake in hopes that she can win over the man of her dreams. But even foolproof plans can go awry. The course of true love is never smooth, as Jane discovers when a case of mistaken identity results in a date with the man she’s admired from afar for years. But she knows all too well that masquerading as her twin sister can only go on for so long before the truth comes out. Melanie Bennett Jacobson is an avid reader, amateur cook, and champion shopper. She consumes astonishing amounts of chocolate, chick flicks, and books. After meeting her own husband on the Internet, she is now living happily married in Southern California with her growing family and a series of doomed potted herbs. JENNIFER K. CLARK grew up in the small mountain town of Monticello Utah where she is proud to say that she passed all of her English classes, and with fairly good grades too. At the time her writing aspirations didn't go much beyond turning in her next essay on time, however, she did have a passion for fictional tales and inherited her father's love of storytelling. Convincing neighborhood kids that their backyards lay over ancient ruins and stories to back it all up was part of daily routine. Made up languages, haunted houses, and tales of jungle adventures were also widely known among her friends. After graduating college, her interest in writing was sparked when she shared one of her made up stories with her sister, Stephonie Williams. Together they wrote their first novel, Mark of Royalty. Since then, Jennifer has fallen in love with the art of writing and has set out to learn the craft of combining the written word with storytelling. With veneration for the Renaissance time period, Jennifer loves to study history and attends festivals depicting that particular era whenever she can. She also finds the study of war strategies irresistible and enjoys reading about the great battles that have shaped history, using them as inspiration in creating the battle scenes in her own books. In her spare time she spends a lot of time with the animals on her farm and still takes time to spin yarns with her kids and other youth in her community. Julie Daines was born in Concord, Massachusetts, and was raised in Utah. She spent eighteen months living in London, where she studied and fell in love with English literature, sticky toffee pudding, and the mysterious guy who ran the kebab store around the corner. She loves reading, writing, and watching movies—anything that transports her to another world. She picks Captain Wentworth over Mr. Darcy, firmly believes in second breakfast, and never leaves home without her verveine. To learn more about Julie Daines or to contact her, visit her website at www.juliedaines.com. 3 of my FAVORITE AUTHORS all in 1 FABULOUS BOOK! 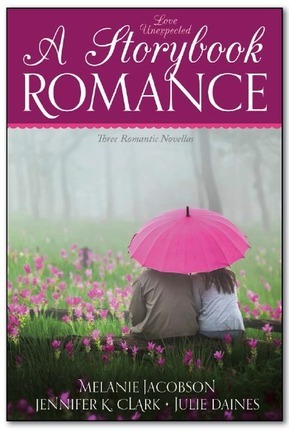 Storybook Romance by Melanie Jacobson —LOVE this story line! So FABULOUS! A supposedly one-time letter turns into an online correspondence and takes the story into a wonderland of romance. FANTASTIC TWIST at the end! WOW! He Loves Me Not by Jennifer K. Clark —So what happens when a friend tries to help a friend? 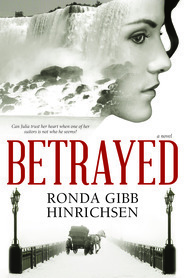 Mistaken identity and misplaced feelings abound...GREAT story! A whirlwind of emotions... work troubles and finally love in all the right directions. Fools of Us All by Julie Daines —I LOVED the subtle humor in this story! I also loved the raw emotions of taking care of a loved one and wanting to have hope, but fearing to do so. A WONDERFUL story that left me wanting more!